In November 2009, the MLIRC officials had written to the district administration asking how permission was granted for the construction of the college without their consent. 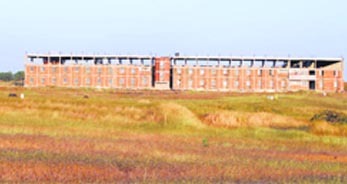 The Suresh Angadi Education Foundation’s Angadi Institute of Technology and Management (AITM) have been built amidst a firing range on Survey No. 72/73, which lies in the danger zone in the “Baghdad-Asmara field firing ranges”. The said area has been notified as a firing range in the Karnataka Gazette notification of February 10, 1981. The office of the Deputy Commissioner had granted permission for conversion of land purchased from private individuals. The land in question falls in an area notified the firing range. The permission for conversion of land for non-agricultural purpose was given on the condition that it (permission) would be withdrawn if there were any objection from the Indian Army. The fact that the college has already commenced it is hard to believe how the college got permission to construct the same without the NOC from the MLIRC. The letter which was given in November the DC, J Ravishankar in the past week said he will inspect the place and give his decision, but later sent Addl DC Mr.Torgal, Asst Commissioner & Tahshildar to visit the place along with MLIRC officials. The District administration is asking were the MLIRC officials sleeping when the building was being constructed. Mr. J Ravishankar who was supposed to give a reply suddenly went on a 10 day leave. Citizens are speaking how is that the DC went on a leave now only. Still the site is a notified as a firing range under the Karnataka Gazette and hence any building on that site will be illegal. It remains to be seen how things frame up here. Is the law same for all? The answer to which one will get in the time to come.